Your employees will be more productive when they get full-shift capacity batteries for their mobile computers. Studies show that an employee loses an average of 20-30 minutes of work every time a battery fails. Multiply that figure by your number of mobile workers and you can see how much batteries cost your company. With our batteries, your employees’ scanners will run longer. That means more productivity from your workers and fewer batteries to purchase over time. We also offer chargers and powered holsters that are designed to keep your mobile devices running. Check out our complete product offering for mobile computers. All of our products are guaranteed compatible with your OEM device. The GH7035-Li is a direct replacement for the P/N 62-013 battery that is used in the Psion-Teklogix 7035 barcode scanners. It extends the device’s operating time and reduces the total number of batteries needed. The GH7535-Li(19) is a replacement battery for the Teklogix 7535 handheld mobile computer. It optimizes the device’s performance by increasing runtimes and eliminating the need for extra batteries. The GHMX7-Li is a replacement for the OEM P/N MX7A380BATT that are used in LXE MX7 Mobile Computers. The H2280S-M is a direct replacement for the OEM P/N 155467-0001 battery that is used in the LXE 2280-2285 series hand-held scanners. It provides longer cycle life, reducing the total number of batteries needed. The H3100-M is a direct replacement for the OEM P/N 21-36897-02, KT-12596-01 and KT-12596-04 batteries that are used in the Symbol 3100 series hand-held scanners. It has been proved to withstand rigorous testing including temperature, vibration, shock, drop, short circut, and overcharge. The H4071-M is a direct replacement for the OEM P/N 21?19022?01 battery used in the Symbol LS4070 series hand-held scanners. It has been proved to withstand rigorous testing including temperature, vibration, shock, drop, short circut, and overcharge. The H4090-Li is a replacement for the OEM WT4090 that is used in Symbol/Motorola WT4090 mobile computers and WT41NO terminals. The H4090-Li(2x) is a replacement for the OEM BTRY-WT40IABOH that is used in Symbol/Motorola WT4090 mobile computers and WT41NO terminals. It extends the device’s operating time and reduces the total number of batteries needed. The H4420-Li is a direct replacement for OEM BTRY-11-0023 that is used in Falcon® 4420 series scanners. Extends operating time and reduces total number of batteries needed. The H6100-M is a direct replacement for the OEM P/N 21-41321-03 battery that is used in the Symbol 6100 series scanning device. It has been rigorously tested, including temperature, vibration, shock, drop, short circuit, and overcharge. The H6800-Li is a replacement for the OEM P/N 21-54348-01 and 21-40340-01 batteries that are used in the Symbol 6800 series hand-held scanners. It provides a cycle life of up to 15% longer than the standard OEM battery. Replacement battery featuring the highest quality battery cells, excellent discharge characteristics, and longer cycle life. H8440-Li(S) - Compatible with Spectralink 8400 Series. High capacity replacement for Spectralink #1520-37214-001. Our H8440-Li(S) battery is compatible with the Spectralink 8400 Series of devices. It is the high capacity replacement battery to OEM Spectralink 1520-37214-001. This battery is available in both blue and black. Color coded batteries enable you to make quick and simple battery age identification. Significantly longer duty cycles and higher capacity. The H905A-Li is a direct replacement for the OEM 21-62960-01 battery that is used in the MC9000 SHOBAB0000 (MC9000 S Series). It provides longer cycle life and excellent discharge characteristics. The H960SL-Li is a direct replacement for the OEM P/N 23065-001, 23065-002 and the 23065-003 batteries that are used in the Telxon 960SL Series Scanning Device. With the highest quality battery cells to provide longer cycle life, the H99EX-Li(H) from GTS is the premier rechargeable battery for Honeywell Dolphin 99EX/GX devices. The HA720-Li(S) is a direct replacement for the P/N HBT-901 battery that is used in the Vocollect A710 and A720 barcode scanners. It is designed to maximize the performance of your Vocollect scanner. The HCK1-Li is a direct replacement for the OEM Model AB1G P/N 73659 battery that is used in the Intermec® CK1 scanner. The HCK30-Li is a direct replacement for the OEM Model AB1G P/N 318-020-001 battery that is used in the Intermec® CK30 scanner. The HCK3-Li is a direct replacement for the OEM 318-034-001 batteries that are used in the Intermec CK3 scanning device. The HCK60-Li(2x) is a direct replacement for the 318-015-001 and 318-015-002 batteries that are used in the IER680 scanner. The HCK60-Li(2x) also works in PB40, PB41 and PB42 printers. It has more than twice the capacity of the OEM battery and contains the highest quality battery cells. The HCK60-Li(S) is a direct replacement for the 318-015-002 batteries that are used in the CK60 devices. It extends the device’s operating time and reduces the total number of batteries needed. The HCN1-Li is a direct replacement for the battery that is used in the Intermec CN1 mobile computer. The HCN2-Li is a direct replacement for the Intermec CN2 Model 074201 P/N 074201-003 battery that is used in the Intermec CN2 mobile computer. Its ruggedized plastic housing and internal assembly complies to UL94 standards. The HCN3-Li is a direct replacement for the OEM P/N 318-016-002 battery that is used in the Intermec CN3 and CN4 mobile computers. Its ruggedized plastic housing and internal assembly comply to UL94 standards. The HCN50-Li is a direct replacement for the OEM 318-039-001 batteries that are used in the Intermec CN50 devices. Provides Smart Data such as cycle life, State Of Health, and serialization. The HCN70-Li is a direct replacement for OEM 318-043-002 / 318-043-012 / 318-043-022 / 318-043-023 batteries that are used in the Intermec CN70 / CN70e devices. The HFUS220-Li(19) is a direct replacement for the OEM P/N CA50601-1003 battery that is used in the Futjitsu 100 series mobile computers also known in the United States as I-PAD and in Europe as B-PAD. The HHHP7200-M is a replacement for the OEM P/N 200-00233 battery that is used in the HHP Dolphin 7200 scanner. The HHHP7400-M is a direct replacement for the OEM P/N 200-00589 battery that is used in the HHP Dolphin 7400 Scanner Device. It improves the device’s cycle life and provides excellent discharge characteristics. The HHP6500-LI is the battery for the Honeywell HHP6500 Handheld Computer. The HHP6500-LI(S) is the battery for the Honeywell HHP6500 Handheld Computer. The HHP7850-Li is 100% compatible replacement battery for Honeywell Dolphin 7850 devices. The HHP9500-Li is an upgrade to the OEM battery P/N 20000591-01 that is used in the HHP Dolphin 7900/9500/9550/9900 and the LXE MX6 mobile computers. It has 10% more capacity than the OEM battery. The HHX1-Li is a direct replacement for the OEM 0369B battery that is used in the Voxware VLS410/HX1 device. The HIN2420-Li is a direct replacement for the OEM P/N 068537 battery that is used in the Intermec Antares scanning devices. It extends operating time and reduces the total number of batteries needed. The HLS4278-M is a direct replacement for the OEM BTRY-LS42RAA0E-01 that is used in the Symbol LS4278 Barcode Scanner. It provides longer cycle life and extends the device’s operating time. The HMC1000-LI is a durable replacement for the OEM BTRY-MC10EAB00 battery, featuring the highest quality battery cells to provide longer cycle, extend operating time, and reduce the total number of batteries needed over the lifetime of your device. The HMC3200-LI(H) is a high performance replacement battery for MC3200 Zebra / Motorola mobile computers. The HMC3200-LI(S) is a replacement battery for Zebra / Motorola MC3200 mobile computers. A rechargeable battery for the Motorola/Symbol® MC3100 Mobile Computer. The HMC 3X00-Li (H) has gone through rigorous testing to ensure high quality. The HMC50-Li is a direct replacement for the OEM P/N BTRY-MC50EAB02 batteries that are used in the Symbol MC5040 PDA/scanner. It provides longer cycle life and excellent discharge characteristics. The HMC50-Li(36) is a direct replacement for the OEM P/N BTRYMC50EAB02 batteries that are used in the Symbol MC5040 PDA/scanner. It contains the highest quality battery cells, extending operating time. The HMC55-Li(1.5X) battery is a lightweight, high capacity battery. It extends operating time, has increased life cycles, and contains the highest quality battery cells. The HMC55-Li(1.5X) is a lightweight, high capacity battery. It provides extended operating time, increased life cycles, and contains the highest quality battery cells. Door features IP54 sealing, including an integrated gasket and latches with improved latching connection. Door features include an integrated gasket and latch design with elastic strap for secure closure and IP54 sealing mechanism to improve latching connection. The HMC70-Li(22) from GTS is a battery for the MC70 Rugged Enterprise Digital Assistants from Symbol Technologies. It replaces the OEM 1x standard battery (part numbers 83-71363-01 and BTRY-C70EAB00) and offers longer run-time and cycle life. The HMC70-Li(36) from GTS is a battery for the MC70 & MC75 Rugged Enterprise Digital Assistants from Symbol Technologies. It replaces the OEM 1x and 1.5x battery packs and offers significantly longer run-time and cycle life with minimum increase in form factor. 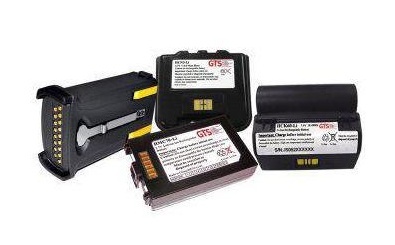 The HMC70-Li(48) from GTS is a battery for the MC70 Rugged Enterprise Digital Assistants from Symbol Technologies. It replaces the OEM 2x battery (BTRY- 70EAB02 800 mAh) and offers significantly longer run-time and cycle life. A dependable rechargeable replacement battery for Symbol MC9000 Series. This battery provides more charge cycles and longer battery life and features highest quality graded and sorted battery cells, full shift operation, and reinforced contact assembly, just to name a few. The HMC9000-Li(24) is an upgrade to the OEM P/N 21-65587-01, BTRY-MC9X-26MA-01, and KT-21-61261-01 batteries used in Symbol MC9000 series devices. The HMC9500-Li is a rechargeable battery for Motorola MC9500/MC9590 devices. It is an intelligent battery with onboard fuel gauge and state of health indicator. Rigorous testing including temperature, vibration, shock, drop, short circuit and overcharge. The HMC9500-Li(1.5x) is a rechargeable replacement battery for the Zebra MC9500 and MC9590 series devices. This battery works with Datamax-Oneil MF2TE printers. It replaces the OEM part number 55038 battery. The HMT2070-Li is a direct replacement battery for Motorola MT2070 and MT2090 mobile computers. The HPSF-M is a direct replacement for the OEM battery 00-864-00(PSC) and 990004-0002(LXE) that is used in the PSC Falcon handheld scanner and LXE MX2 handheld wireless computer. The HRS507-Li replaces the OEM P/N KT-BTRY-RS50EAB02-01 batteries that are used in the Motorola RS507 Ring Imager. It provides twice the capacity of the standard RS507 battery and is ETL listed. /8800/8846 and Symbol PDT 8100 quick grip devices. The HS7500-Li is a direct replacement for the OEM P/N 21-38602-06, 21-65782-06 batteries that are used in the Symbol PDT7500 series scanning devices. It is compatible with basic Windows CE and Symbol basic battery monitoring applications. The HS8000-Li is a direct replacement for the OEM battery P/N 21-54882-01 rev B that is used in the Symbol PDT8000 scanning devices. It provides longer cycle life and excellent discharge characteristics. The HSIN730-Li is a direct replacement for the OEM P/N 318-011-001, 318-011-002, 318-011-003, 318-011-004 & 318-011-007 batteries that are used in Intermec 700 Mono series. It significantly extends operating times and reduces the total number of batteries needed. The HSIN740-Li is a direct replacement for the OEM P/N 318-013-001, 318-013-002, 318-013-003 & 318-013-004 batteries that are used in Intermec 700 series color mobile computers. It has endured rigorous testing including temperature, vibration, shock, drop, short circut,and overcharge. The HSLMX1-M(14) is a direct replacement for the OEM P/N 153521-0004 used in the LXE MX1 mobile computer. It increases the device’s cycle life and allows for maximum productivity. The HSRX2-LiP is a direct replacement for the P/N BT-1000-1 battery that is used for Vocollect SRX2 headset devices. The HT2-Li fits in the Vocollect Talkman T2/T2X wearable computers. It is comparable to the OEM P/N BT 602-1. It extends device operation time and provides for increased productivity. The HT5-Li is a replacement battery for Vocollect Talkman T5 wearable computers. It has 9% more capacity than the OEM battery and contains the highest quality battery cells. The HWS1000-Li(20) is a direct replacement for the OEM P/N 20-16228-07 and 20-16228-09 batteries that are used in the Symbol WSS1000 series.